In a startling case Bollywood’s iconic actor Ranbir Kapoor has been booked in ‘Cheating and Conning Case’ in Mumbai. Besides Ranbir Kapoor, actor-director Farhan Akhtar too has also been booked in a criminal breach of trust and forgery case for promoting an online shopping site which is allegedly ‘duping’ customers. The Madiyaon police station (about 10 km from in Mumbai) informed media that a F.I.R. has been registered against both actors Ranbir Kapoor and Farhan Akhtar for promoting a portal askmebazaar.com that is allegedly conning consumers by collecting money for them but not delivering the promised product. The F.I.R. has been lodged by a lawyer Rajat Bansal who has complaint that his client a resident of Keshav Nagar, has been duped by the portal of Rs 30,000/-. According to the police Rajat Bansal’s client had ordered a 40-inch LED TV from the portal after being influenced by the actors Ranbir Kapoor and Farhan Akhtar’s effective promotion. He paid Rs 29,999 by debit card but despite waiting for 10 days he did not get the promised LCD TV. The police have booked Ranbir Kapoor and Farhan Akhtar under IPC sections 406 (Punishment for criminal breach of trust) and 420 (forgery) on September 19,2015. 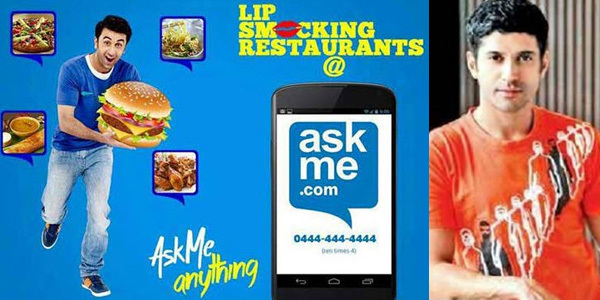 Besides Ranbir Kapoor and Farhan Akhtar, the police have also booked directors of online askmebazaar.com - portal Sanjiv Gupta, Anand Sonbhadra, Piyush Pankaj, Kiran Kumar Sriniwas Murti and marketing officer Puja Goyal. Bansal. It may be noted that this is not the first time when film stars have come under scanner for promoting products that have conned people into beveling their sweet talks and falling prey to them. Remember Madhuri Dixit becoming victim of FDA for promoting Maggi Noodles.